The 2017 professorship was awarded to Dr Ramani Moonesinghe for a lecture entitled Citizen science: A unique opportunity for anaesthetists to lead research innovation which she will present at the RCoA's Winter Symposium in December 2018. 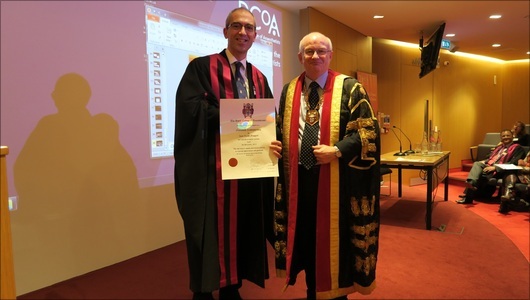 The 2016 winner of the Macintosh Professorship was Dr Matthew Wilson for a lecture entitled 'Trials of Labour: national multicentre randomised studies in obstetric anaesthesia' which he presented at the RCoA Summer Symposium on 14th June 2017 and was awarded a certificate by the President of the College, Dr Liam Brennan. This is a joint Macintosh Professor award between the RCoA and Obstetric Anaesthetists' Association (OAA). 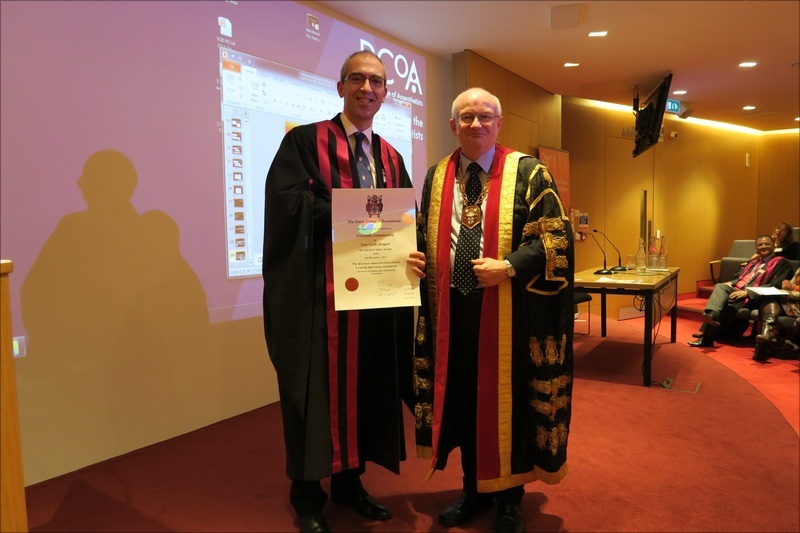 Dr Moppett presented his lecture at the RCoA Winter Symposium on 25th November 2016 and was awarded a certificate by the President of the College, Dr Liam Brennan. Dr Howell presented his lecture at the RCoA Anniversary Meeting on 9th March 2017. In 2014 the Macintosh Professorship was awarded to Dr Daqing Ma for a lecture entitled, 'The potential impact of anaesthetics on cancer reocurrence following surgery'. Dr Ma presented his lecture at the RCoA Anniversary Meeting on 12th March 2015. In 2013 the Macintosh Professorship was awarded to Dr Carol Peden for a lecture entitled, 'Improvement Science for Anaesthesia and Intensive Care'. The winners of the professorship in 2012 were Dr Tim Cook for a lecture on the third, fourth and fifth National Audit Projects of the Royal College of Anaesthetists, known as the NAPs, and Dr Suellen Walker for a lecture entitled, 'Translational Research: Informing Paediatric Pain Management'. Dr Cook presented his lecture at the Anniversary Meeting on 13 March 2014 and was awarded a certificate by the President of the College, Dr J-P van Besouw. Dr Walker presenter her lecture at Congress on 5 May 2014 and was awarded a certificate by Dr Liam Brennan, Vice-President of the College. The winners of the professorship in 2011 were Dr Jaideep Pandit for a lecture entitled, 'Interactions of volatile anaesthetics and the hypoxic ventilatory response at cellular-molecular level: advances by 'reverse translation', and Dr Rupert Pearse for a lecture entitled, 'Peri-Operative medicine: opportunity or threat...?'. Dr Pandit presented his lecture at the Current Concepts Symposium on Thursday 1 November 2012 and was awarded a certificate by the College's Vice-President, Dr Debbie Nolan. Dr Pearse presented his lecture at the College's Anniversary Meeting on Wednesday 13 March 2013 and was awarded a certificate by the President of the College, Dr J-P van Besouw. The winner of the professorship in 2010 was Dr Jonathan Thompson for his lecture entitled, 'What is the Role of Urotensin in Cardiovascular Disease?'. Dr Thompson presented his lecture at the Current Concepts Symposium on Thursday 3 November 2011 and was awarded a certificate by the President of the College, Dr Peter Nightingale. The winner of the professorship in 2009 was Dr Sunit Ghosh for his lecture entitled, 'The Papworth BiVent Tube: A New Device for Lung Isolation'.